St. Luke Catholic Church is a Eucharist-centered parish, loving God, serving others and transforming the culture by our witness to the message of the Gospel in the way we live our lives and generously share our gifts. The Diocese of St. Augustine can trace its beginning to Bishop Jean-Pierre Augustin Marcellin Verot, who had been born in France in 1805 and had been in the United States since 1830. In February 1858, he was appointed Vicariate of Florida and arrived in St. Augustine on June 1 later that same year. Bishop Verot traveled throughout Florida and quickly found that there were not enough priests to adequately serve the state. He managed to bring a few priests, brothers and nuns from overseas over the next several years, but it still wasn’t enough to serve the Catholics scattered across the vast geography of the state. Things worsened for Florida Catholics after the Civil War broke out in April 1861. Bishop Verot, who was named Third Bishop of Savannah by Pope Pius IX in July 1861 while still retaining his duties in Florida, saw the churches in Mayport, Fernandina, and Jacksonville destroyed during the war, which ended in 1865. The Catholic community rallied and rebuilt, and by 1869 there were 19 churches and chapels, seven schools, 12 priests, and 10,000 Catholics scattered throughout the state. That same year, the assembled bishops as the Tenth Provincial Council of Baltimore unanimously voted to erect a new diocese in Florida. On March 11, 1870, the Diocese of St. Augustine was created. It covered the entire state of Florida, though it was eventually split into six others. There was still a shortage of churches and priests, however. Though there had been a mission established in Middleburg, Catholics in the area traveled to churches in Orange Park or Green Cove Springs for masses. They had to wait more than a century to have a church of their own. In the Gospel according to Matthew, Jesus told his disciples, “For where two or three are gathered together in my name, there I am in the midst of them.” Those 13 families certainly felt the presence of the Lord in the services that were held at Middleburg Elementary, the Middleburg Civic Center, and their own homes, but they longed for their own church – especially if their group was to grow. Luckily, the diocese was thinking along similar lines. Bishop Paul Francis Tanner, who had become the bishop of the diocese in February 1968, had purchased a 25-acre plot of land on Blanding Boulevard near the intersection of Old Jennings Road in the early 1970s for the purpose of eventually establishing a parish in Middleburg. Because the parish also was to serve the Doctors Inlet area, it was named in honor of Saint Luke the Evangelist, the patron saint of artists, physicians, surgeons, students, and butchers. It took another few years before there was anything on that land and it happened because of a gift from an Orange Park physician who donated a small building she had purchased from First Baptist Church in Orange Park, which was then located close to the St. Johns River. Father Luke McLoughlin and several parishioners, including some of the founding families, moved the church up Kingsley Avenue and down Blanding Boulevard to the 25-acre plot. Repairs, utility hookups, and a fresh coat of white paint took several months, but when the work was finished the first Catholic church in Middleburg – nicknamed the little white church on the prairie -- was open for business. Father Luke McLoughlin said the first mass in the church on Christmas Eve 1976. It only took four years for the number of families to grow from 13 to 170. It was well above 200 in July 1982 when the diocese officially created Saint Luke Parish and placed it under the spiritual guidance of Father Edward Rooney. Four years later, the membership had topped 300 families and there just wasn’t enough room in the little white church. Saint Luke Parish needed a new home. The solution? A 10,00 square-foot rectangle that served dual purposes as a church and hall/meeting facility/offices. Construction was completed in the first half of 1986 and Bishop John Snyder blessed the new church on May 11, which also happened to be Mother’s Day. 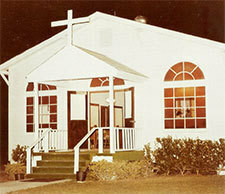 The little white church, by the way, was donated to Branan Field Baptist Church, where it still sits today. St. Luke Parish, as well as Clay County and Middleburg, continued to grow and by late 2002 it boasted more than 1,000 families. There just wasn’t enough room in the church for the three weekend masses, special events, and the day-to-day work required to operate a parish of that size. It was time to build Saint Luke Parish another home. This time, they went big – both in size, cost and style. The groundbreaking for the new church happened on August 27, 2000, and construction was completely in September 2002. The 24,000-square foot church was designed by Bhide & Hall Architects and build by the Bob Mathews Construction Company at a cost of approximately $3.1 million. There are some wonderful handcrafted features throughout the church, beginning with the four front doors made of Burmese teakwood and fabricated in India. The design on the doors was done by Vasant Bhide of Bhide & Hall and carved by local Indian craftsmen. The baptismal font and pool were made in Bombay, India. The baptismal bowl was carved from a single slab of Rajasthani marble. The processional cross, altar and paschal candle stands were crafted out of Spanish silver at the studios of Artistic Silver in Madrid, Spain. Crafted into the node of each piece is the head of an ox, which is the traditional symbol for Saint Luke the evangelist. The main altar is constructed of Italian Carrera marble and manufactured at the studios of Frano Dolphi in Italy. The stained glass above the altar, as well as throughout the rest of the church, were fabricated and installed by local craftsman Horst Greismann. The sanctuary cross is made of Italian lindenwood and was crafted at the Demetz Studios in Italy. Father Rooney held the first mass in the new church on Saturday, Sept. 28, 2002. Bishop Victor Galeone celebrated a dedication mass on Nov. 17, 2002, at 3 p.m. Meanwhile, as the parish continued to grow and the churches were expanded, Catholics in Clay County began examining the possibility of adding a Catholic school because parents who wanted their children to attend Catholic school had to send them into Jacksonville. A committee of parents met numerous times with Father Rooney, Father James Boddie of Sacred Heart in Green Cove Springs, Monsignor Vincent Haut of St. Catherine’s in Orange Park, as well as Patricia Tierney, the diocese’s superintendent of Catholic schools, and eventually the group came up with an interparochial school, since no one Clay County parish could support a school. Annunciation Catholic School opened in August 1993. Housed in two portable buildings next to the Saint Luke Parish church/hall, there were 51 students enrolled in kindergarten through second grade. Parents were instrumental in helping prepare the school for opening by building playgrounds, hanging chalkboards, purchasing second-hand desks, and various other tasks. An administration building, which also housed a media center and four classrooms, was built in 1995. Two years later another building that featured eight classrooms was built as well as a playground and lunchtime picnic area. Another eight classrooms were added in 2001. The school now features 20 permanent classrooms, a health room, library, computer lab, administrative offices, and athletic fields and has an enrollment of approximately 500 students in Pre-K through eighth grade. The school is currently in the process of constructing a gymnasium/multi-purpose building that also would serve as a cafetorium. Father Rooney had overseen massive growth in Saint Luke Parish from its days in the Little White Church on the Prairie to the 24,000 square foot church perched on the corner of Blanding Boulevard and Old Jennings Road. But after 28 years of serving the parish he was ready to retire. It was during his retirement reception on June 27, 2010 that he was given a piece of immortality when the parish hall was renamed in his honor: Edward K. Rooney Parish Center. Attached to the front of the building are the words “… some thoughts,” an homage to the way he would end each homily. Father Rooney’s official last day was June 30, 2010. The following day the parish was placed in the hands of Father Andy Blaszkowski, who had been the parochial vicar at the Cathedral-Basilica of St. Augustine. Farther Blaszkowski has overseen even more growth in the parish, which is currently at 2037 families. Among his biggest accomplishments was helping facilitate the addition of the St. Luke Child Care Center. The 9,720 square-foot facility is located between the parish hall and Annunciation Catholic School and opened in July 2013. It cares for children ages six weeks though VPK and is open to all families regardless of religious affiliation. The parish has grown so much that Saint Luke now has two full-time priests. Father Jaisemon Xaviour assists Father Blaszkowski in serving the community. It was during construction of St. Luke Child Care Center, that it became apparent that the beautiful, mature Pecan tree on the property, would need to be removed. Wanting to preserve the tree for the Parish, Father Andy commissioned Carl G. Fougerousse of Red Fern Fine Art Studio of Savannah, GA to sculpt the magnificent crucifix that adorns the altar today. Over the course of several years, parishioner artist Joe Puskas, has lovingly shared his talent with St. Luke. Mr. Puskas beautifully composed the mural paintings of the Nativity, and the Resurrection, as well as the Crucifixion mural above the altar, and the Holy Spirit and the heavens in the cupola. In 2018, St. Luke undertook the glorious “Modern Day Saints and Witnesses to the Resurrection” Stained Glass Project. Consisting of a total of 30 windows, the project has again been commissioned to Carl G. Fougerousse of Red Fern Fine Art Studio of Savannah, GA. Several stunning windows are now installed, and completion is expected by the Feast of St. Luke, 2019. Saint Luke Parish has risen from its humble beginnings and experienced tremendous growth over the past 40-plus years. It’s exciting to wonder what the future holds.